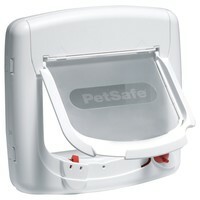 The Petsafe Staywell Deluxe 4 Way Magnetic Cat Flap is a versatile method of controlling the movements of your cat into and out of your home. Designed to only recognise cats wearing the special magnetic collar key, the door can be set to one of 4 settings: Fully Open, Fully Closed, In Only or Out Only. Additional magnetic keys are available separately for multi-cat households.